There was a time when pundits predicted hundreds of thousands would live in Earth orbit or further up the gravity well by the year 2000. The Dream did not last much beyond Richard Nixon's cancellation of the last three Apollo missions, but from time to time it crops up again. By 2020 more than 20,000 men and women will be working aboard these orbiting Islands, and 10 million more high-paid specialists will be supporting them on Earth. That 20,000 number will double each following decade. . . .SIG's larger stations will grow their own food, recycle their air and water, and have their own onboard engines and guidance systems. Water mined from asteroids by "Space Island" will be converted into hydrogen and oxygen rocket fuel by sun-powered converters, letting these Islands travel throughout the inner solar system. 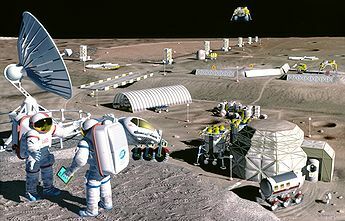 Metals mined from asteroids will let the stations grow without bringing materials up from Earth. What will Space Islanders find on these asteroids and on the planets they visit? Will they find life where its now least expected? Will they find remnants of past visitors? What incredible structures will they build in space, freed from the gravity chains of Earth? I want so hard to believe this possible, as I did in the 70s when I read Gerard K. O'Neill's book The High Frontier. Why do I feel gun shy? It could be that the last time a visionary group promised me world-changing wonders, it was Linden Lab and the potential of Second Life. Like Spooky Mulder in the X-Files, perhaps I do want to believe. But as with the childish hopes for Apollo's legacy and adult ones for virtual worlds, I do feel the pull of SIG's promise. Planetary Resources' deep-pocketed plan to mine an asteroid. As I watched live at NASA, however, the Space X launch was aborted, just as the ignition sequence began. We will have many such disappointments, and worse, on our way to what NASA liked to call "our destiny in space." At least the spacecraft did not blow up, and Space X's team worked quickly and professionally. Today, they got the rocket into orbit and I wish them stunning success in reaching the ISS. As a firm that operates more like a Silicon Valley start-up and less like a huge government agency, Space X gives me some guarded hope that they will, with marginal improvements, get their next launch right. That such events are happening in the midst of a global economic downtown actually gives me a bit of hope that, if matters improve, we may see the first glimmers of a new technological revolution. Because as cool as the Internet is, we remain chair-bound or fixated on our palms. Neither are the places for heroes, explorers, and world-builders. I'd prefer to dream on.